Three Lo-Down Carbons and a ‘Ghost’. The clear skies a few days before I was willingly lured away by the planets had me following up some views beneath the body of the Water Serpent. Where I was getting entertained by three carbon stars – U, V & Y Hya – and PN NGC 3242.....put aside after the happy planet diversion. Today, after some thought, decided to put the Hydra stuff into one presentation – after all nice colour contrasts. The PN is flanked on three sides by the carbons, at 6º to 9º distance, and I have roughly honoured that configuration with the attached renderings. 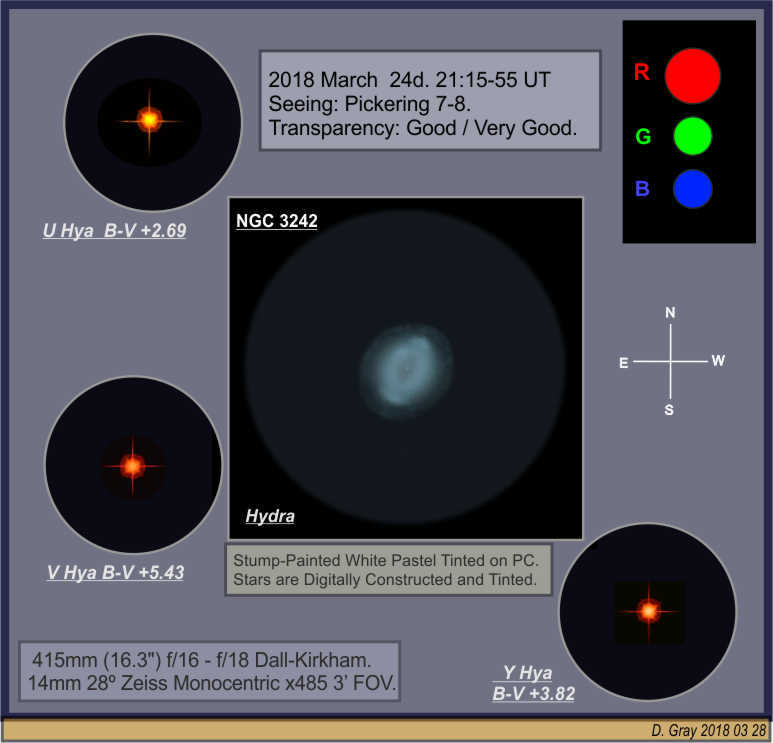 Y Hya: noticeably redder than U and the most southerly at only 13º altitude at best – twixt mag. 7.5 & 8.0 I reckoned..
V Hya: vying for the reddest star I’ve seen and perhaps 8.0-8.5. Like V Aql and VX And one of those carbons that looks of a coppery hue and find when tinting I need a degree of Magenta and less Yellow – the other two certainly look to hold more yellow – especially U Hya. NGC 3542: ‘Ghost of Jupiter’......really.......hmm.....well ok..........So low here yet it gobsmacked me how bright......!!! The best seeing for these was the 24th – 53% moon 40º up and 70º west. This did not affect the views at all; particularly as the 485x Monocentric was used. These objects are all firsts for me........never ever sought them............Low here at best but seemingly their narrowness of wavelength had rendered any atmospheric dispersion unnoticeable to me: tho’ I’d expect their colours would be modified as compared to a higher view aspect. Edited by David Gray, 28 March 2018 - 03:02 PM. Nice sketch of Three Lo-Down Carbons and a ‘Ghost’. . I love the work, moreover glad that everything wasnt a smear at low altitudes. I usually dont comment on your technicals like oculars etc. but that monocentric really piqued my interest here. First just 3' fov(!) at 28°. Thats so narrow and you hand guide! I know you use a GEM but was it a tedious thing to do? I USED TO have a big GEM but have used dob moints the last 9 years so its not so elegant a motion as just gently moving the scope to the west on one axis. Tracking aside, the monocentric. Ive seriously seriously considered getting them, and as much some ball eyepieces. Seibert in the US does a great job in making these among other designs. I know the rule of the day is everyone using ultra wide angles, Nagler types and such and bless the immersive views but can you make an argument for the mono , despite narrow FOV? My least element oculars are 4 element plossls and orthos so Im curious as to the mono or ball advantage. Again nice work above. I wonder Dave, had you tried the 80mm on these stars ? I know color saturation can be so aperture dependent. Pete: I think the 3” (76mm) would do ok with carbons.......for e.g. V Hya is currently similar magnitude to Titan and picked it out straight off (in finder-mode 55x) by its hue; whereas Titan’s hue is borderline in that scope – even far removed from Saturn. Yes the D-K is fingertip control and do not have to put the pencil down (same hand) to do it. It got more challenging when doing that Saturn Nebula sketch with the Mono Barlowed up to 780x (2’ field); but not an ordeal........! “None of my scopes are driven – or ever were – and in the case of the 16.3” Dall-Kirkham this is a high mass instrument. The 120-150lb D-K mounted on ¼ ton of metal work (German Equatorial) it damps almost instantly when touched/moved and can track steadily with just a finger if required. Little affected in average winds; and when they are getting stronger first concern is the open observatory roof by time the observing is affected....! Also it is ultra-precise in sweeping back onto whatever I’m viewing – for e.g. I can sweep up an object after it has drifted for some hours with even >1000x if the (rare) situation arose. So after I had used it for some weeks he surprisingly wrote offering, as an afterthought, the original body for free so I said ok; but seems it went astray in the post as it never arrived. I used the eyepiece mostly with a Barlow on my 10” f/8 Newtonian (also Wildey optics – signed H. Wildey 1963). I have heard that his later optics were of poorer standard due to his failing eyesight – but never had any complaint with the 10” in 14 years use (1964/78) – now mothballed pending re-coating. It was only after a couple of years I found that he had signed (in pencil) the Monocentric – inside the eye-end: see attachment! So my very own, possibly unique, Zeiss-Wildey Monocentric; perhaps a collector’s item?! The 43/47mm size would have adapted nicely to the D-K 50mm holder. But as it is, performs excellently." Edited by David Gray, 29 March 2018 - 10:34 AM. Wonderful sight of the planetary, it looks like a photograph! The carbon stars are awesome too, V hya is so red... Thanks for sharing it! get those good low-altitude conditions after the Moon moves on......! The workmanship back then Dave, all that brass and such. True collectors piece. How would u say it stacks up to todays oculars, fov not withstanding . Contrast only that is. Pete: not that I have a particularly wide experience with more modern eyepieces but I reckon the Mono holds up well; after all it is my goto ep for critical hp-scrutiny - contrast and seeking a darker crisp field in particular. Then again the D-K working at f/16-18 is very forgiving of ep-type – but the Mono worked well on the f/8 10” Newt back in the 60s/70s. I’ll stick it in the f/5 120mm and/or 80mm SW refractors when I get the opportunity and report back. Actually those 1940s military eps seem to have excellent lenses.......my 29mm (60º AFoV) Symmetrical-type (230x-D-K/70x-Newt) has been a regular DSO ep until the 24mm/82º ES Maxvision (285x) came along..........Both give near-equally crisp sharp-to-edge views of planets in the D-K – the ES sharper at the edge, but not dramatically a difference there......! Edited by David Gray, 04 April 2018 - 05:04 AM. Four beautiful sketches from the same sky region. When I am observing I sometimes find carbon stars I stumble across ( if they are very red or pretty bright) cause me to be distracted from what I was going after. You capture those typical colors very well. The Ghost of Jupiter gives up good details to you at low altitude. You raise a good point by mentioning the focal ratio of the instrument. Folks are too quick to trash oculars that dont work with faster focal ratios as though they are intrinsically poor. In truth, like with my longer scopes, its a moot point. Me sweating about how edge of field coma may appear with my scopes is just never on the table. So long as an ocular is made well in construction, its fine as it never has to address the faster scope demons. Thank you for sharing these most excellent sketches. On 22nd April 2015, I observed U Hydrae through my William Optics apochromatic refractor and I was utterly blown away with its colour. It was bright and its orange colour was so intense I had to show it to my wife. I did not give a magnitude estimate at the time but I have since learnt it can reach +4.8 magnitude; which makes it the brightest carbon in the entire sky! It can be just as bright as TX Piscium. But U Hya has a greater range of variability. Frank: some time back I set the normal stellar colour-temperature levels on Sky Map Pro to quite pale and this leaves such as carbon stars and white dwarfs etc. standing out boldly so I am usually quickly alerted of any in a particular location. Apparently a good number of 11th mag and fainter possible carbons – very reddened stars aside – are not noted as variables – some I have found with B-V >+4.00......or is that some quirk/bug of the software?! !.......I recall an earlier SM Pro version showing numerous apparent red dwarfs at 11-light years all over the sky...........! Pete: I think my main aversion/worry with those ex-military eps is the possibility of the glass containing radioactive materials – a UK amateur gave dire warnings on this back in the 60s/70s. Not found any apparent damage to my eyes – still virtually floater-free – wonder if they have been ‘zapped’ away..........no, I put that down to genetics and a watchful diet since my teens.......long story: but Sidgwick to thank I guess! Aubrey: yes U Hya impressed me – tho not as red as the other two – as you point out – a marvelous orange hue.